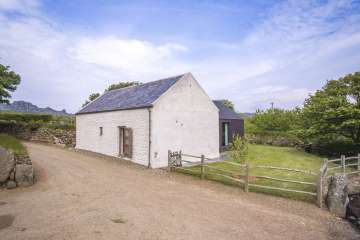 Restored by Griff Rhys Jones, this cool Pembrokeshire coastal cottage with WIFI is one of the best holiday cottages in all of Wales – direct access to the Pembrokeshire Coast National Park footpaths and quality that makes most holiday cottages seem like a joke. Beudy Trehilyn must be one of the loveliest holiday cottages in Wales - one of the group of cottages around Trehilyn farm that form UTT's largest rental in Wales - sleeping up to 22 (or 25 in summer when the Showman's Wagon is in use). Scroll down this page to see the other Trehilyn properties. 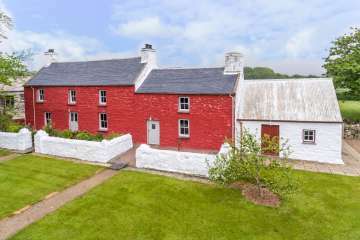 This delightful cottage has been converted from a stone dairy and cowshed by author / TV presenter Griff Rhys Jones on his coastal farm in the Pembrokeshire Coast National Park. 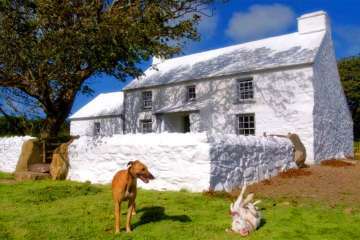 The restoration of the farm was the subject of the popular BBC TV Series 'A Pembrokeshire Farm' - so if you want to stay in Griff Rhys Jones' cottage, then you've found it here! 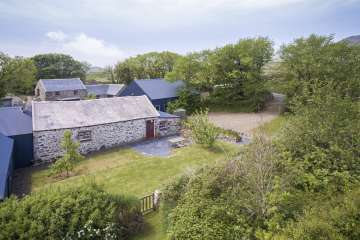 This detached cowshed conversion is set in a peaceful location with seventy acres of farmland with fine sea views to explore. There is real attention to detail here - everything of great quality, with plenty of space and a great garden. Walk to the famous lighthouse on Ynys Meicl or hike out to Porthsychan cove. 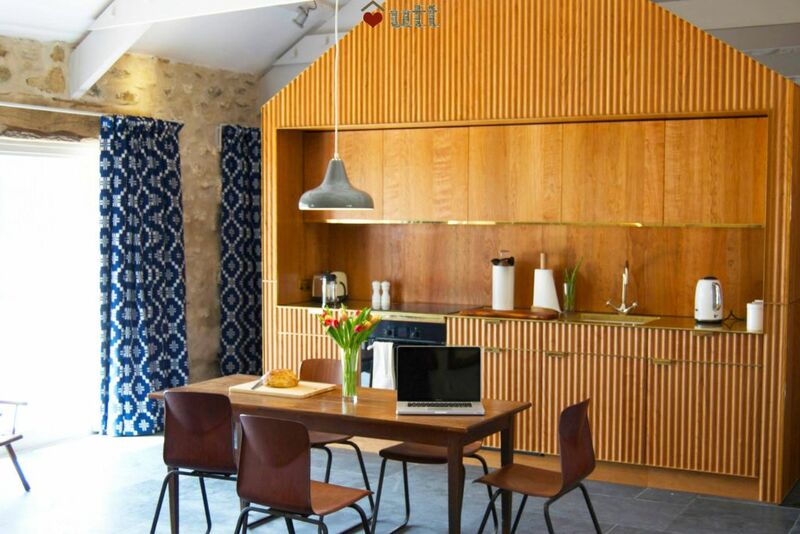 Beudy Trehilyn will appeal to the design conscious, who love the coast. This is the perfect place to explore the beautiful Pembrokeshire countryside and seascapes (watching dolphins) or just simply unwind. 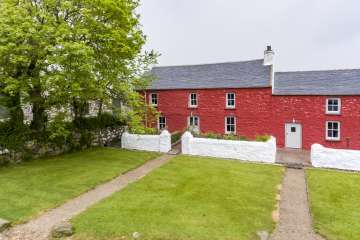 The cottage was amazingly quiet, beautifully renovated (the underfloor heating was a revelation) and wonderfully located. We had a lovely week. Thank you. There is a Strumble Shuttle (404) from Fishguard which can be flagged down right outside (Google 'Strumble shuttle' for timetables), and there are a few trains a day to Fishguard & Goodwick Station. The cottage has underfloor central heating throughout & a wood burner. 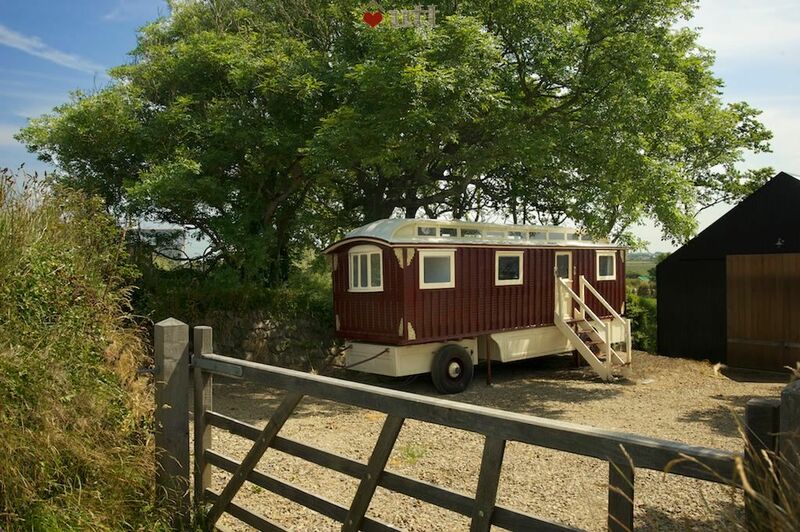 Access over 70 acres of land and many local footpaths. Nature walk (enclosed from livestock) along the stream to far end of the farm and a ruined cottage. In summer months (approximately April 1st to October 31st, but please check if your stay is near these dates) you have access to Griff's restored circus Showman's Wagon, located fairly close to Beudy in its own little field. 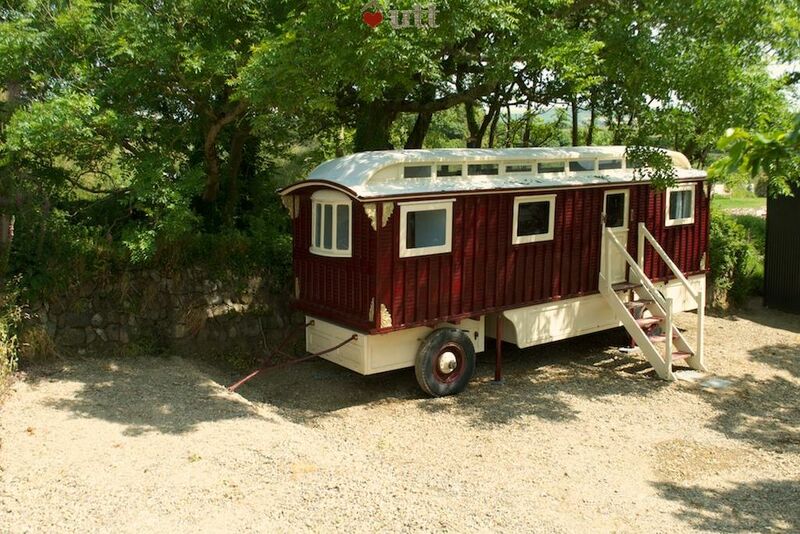 You can use it as an en-suite romantic bedroom, or 'camping' for older children. However, it is not suitable for young children who need to be supervised, as it is the other side of a barn and not visible from Beudy. 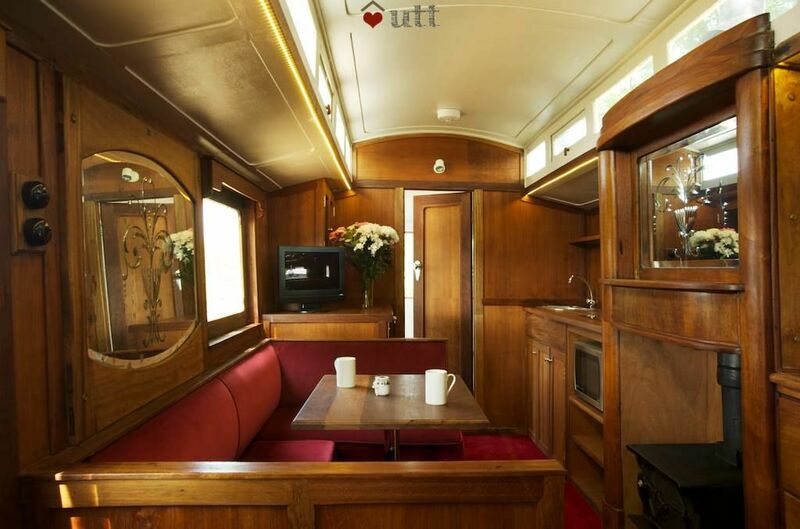 Panelled living, dining and kitchen area - with decorative etched Venetian style mirrors. Dining table with seats surrounding on 3 sides (seating for 4). Flat screen TV for use with DVDs only (no television signal). Separate bedroom with small double bed (110 x 180) and wardrobe, space for cases etc. under the bed. It is also possible to make a single bed from the seating area in the living room. 51 forts and castles to see in the county! Absolutely loved our stay at Beudy Trehilyn. As with all cottages at Trehilyn, the facilities are first rate. We enjoyed the walks around the farm, picking blackberries to make a pie. Trehilyn is so relaxing it's a pleasure to return each year. 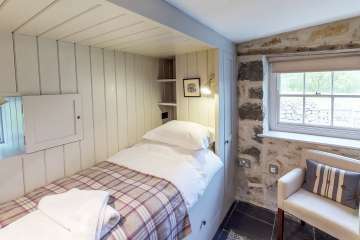 We loved the design detail and craftsmanship that made this cottage a very special and comfortable place to stay. Our kids loved the showmans wagon. Pembrokeshire coast has loads of treasures to explore and from enjoying great family and surf whitesands to walking the coastal path to beautiful quiet coves, boat trips and dare devil high jumps into the magical blue lagoon. Amazing cottage and location. We loved waking up each morning and the toddler visiting the sheep, calf and nature trail outside the front door. The cottage is lovely and we will be returning. The whole farm is a gem to have found. A comfortable, lovely and well-equipped cottage in a stunning landscape. We made good use of the local information about coastal paths and hidden beaches and very much enjoyed our stay. The cottage, Beudy, was good. The beds were very comfortable, the living area was spacious, and also comfortable, with the table big enough for 4. More, would have been a squeeze. We had some problems with the hob on arrival, and unfortunately I had to call the housekeeper for clarification (it's an induction hob). The hobs only appeared to work when saucepans were placed on top but with some weight in them. This was unlike our other experiences of convection hobs, and so fooled us. Apologies to the housekeeper for having to call her round. Perhaps a note about this in the cottage would be good. We didn't find any games or playing cards in the cottage, and as we found ourselves housebound for a day, due to heavy rain, this would have been perfect. A lovely short break. Thank you Griff, UTT and the team. What a lovely cottage, beautifully converted and in a stunning location. We look forward to a return visit! What a wonderful place! Had a relaxing time in the well appointed beudy. The whole stay was great from start to finish. 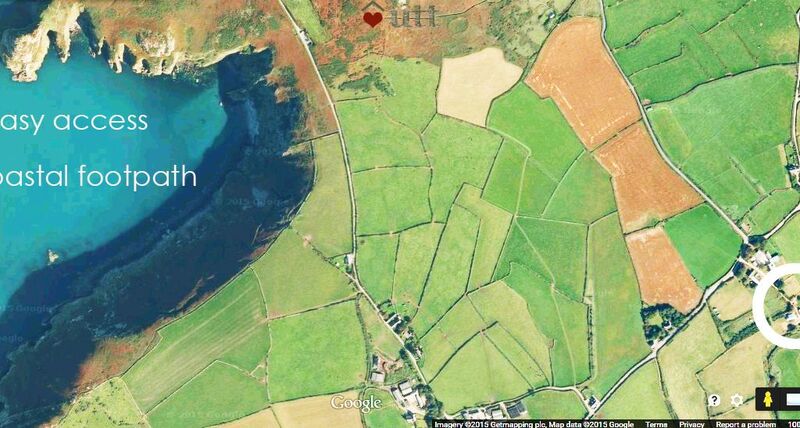 A perfect spot for visiting north Pembrokeshire. Well equipped cottage. Will return! Just returned from a wonderful 3 nights stay at Beudy Trehilyn . A perfect break away in a beautiful part of Pembrokeshire . The house was perfect and wonderfully clean more like a boutique hotel and so warm and cosy . We will definitely be returning .. Claire and David James . September , 2017 . 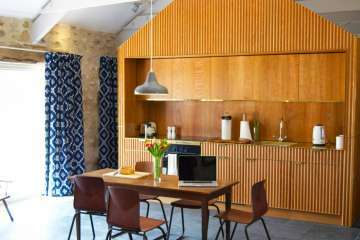 Beautiful, cosy accommodation with stylish design touches. 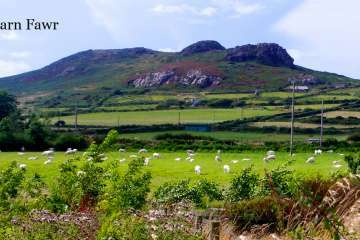 The enclosed paths around Trehilyn and beaches close by were also perfect our dogs - which meant we all had a wonderful time. Such a fantastic week in this beautiful place. 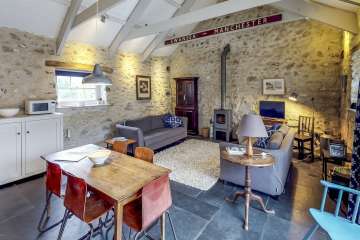 Beudy Trehilyn is beautifully converted and was such a lovely space to spend time in. Easy access to great beaches. The perfect summer holiday. We had a great time in a unique and truly special location. It was a perfect short break and great for exploring the West Wales coast with our two dogs. 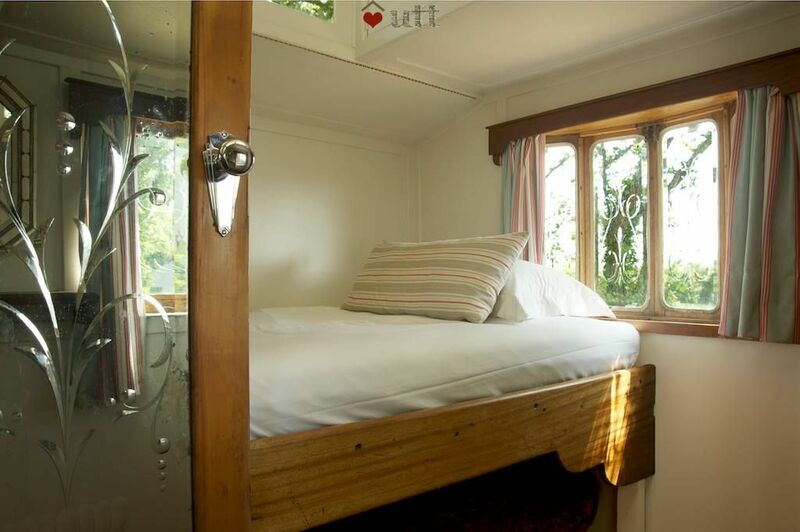 The cottage itself was extremely cosy, spacious and welcoming with everything you need and a touch of added luxury. The Showman's Wagon was the icing on the cake, such a great place to chill out and read the papers. We loved how quiet and peaceful the area was and we'll definitely be coming back again for a longer stay soon. We had an amazing time at Beudy Trehylin. A delightful cottage in a beautifully landscaped setting. Warm, clean, comfortable and appropriately furnished....just right especially with a 90yr old guest! We had a wonderful few days in Beudy Trehilyn. We were at times reluctant to go out, feeling so warm and relaxed in this beautiful place! Both the building and the setting were a delight. As fans of good design, this place doesn't disappoint. The level of thought and careful attention poured into the restoration of this building is clear to see, and we came away feeling inspired by it all. We loved watching the DVD's provided, which documented the renovation of the whole farm. It is clear to see the dedication and care taken to bring this wonderful piece of Welsh history back to life. Many thanks to all those involved, and thank you for opening it up to the public to be enjoyed. Keri, Paul and Joe Johnson, Bath. A wonderful stay - such a cosy cottage and we loved the secluded sun trap of a garden after our long days' walks. 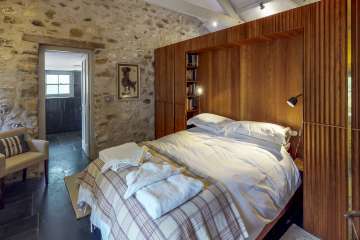 The bed, wet room and woodburner were all great too. We had such a quiet and relaxing time away from the stresses of our daily lives - I'm sure we'll be back! This was our second stay in Beudy Trehilyn, and we will definitely be coming back! We can't fault this cottage! So cosy and warm, you can't resist the wood burner! We stayed for New Year's Eve and we even had a Christmas tree - lovely little touch! Thank you for a most relaxing, chilled stay! We were thoroughly impressed by both the accommodation and facilities. It has been converted with great thought and the end result is an inspirational and practical space which we didn't want to leave. 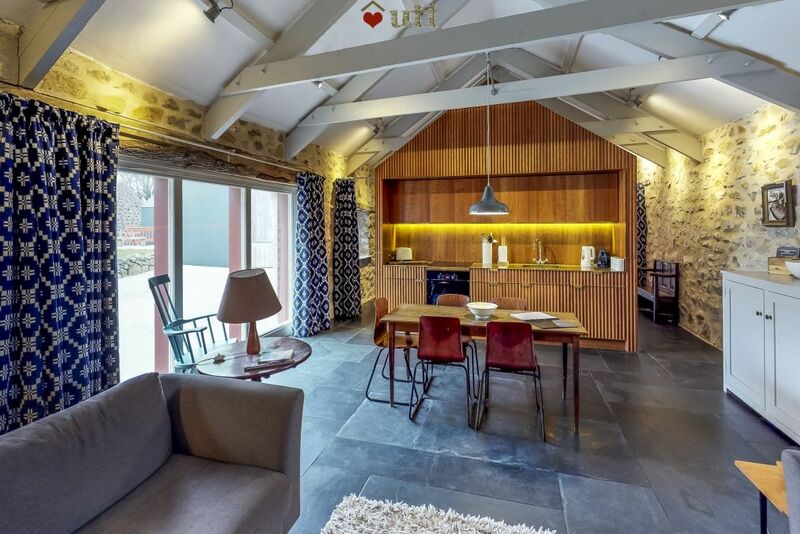 The other properties don't overlook it and there's a great little 'shop' in a barn for essentials. The area is wonderful, even in mid November. The only drawback was the lovely underfloor heating made for rather too balmy a nights sleep because the bedroom area is within the main living space, just divided by an ultra funky wooden divide (which also creates the kitchen). 9 out of 10 - at least. A secluded cottage - perfect for some well needed 'down-time'. High standard interior and exterior to the property. We did book the showman's wagon but it was a little too chilly. Great information / helpful tips given in the folder in the property - well worth taking the time to read it! The children loved the honesty shop in the barn - a great quirky feature! A great base for exploring the area and we were lucky with the weather. 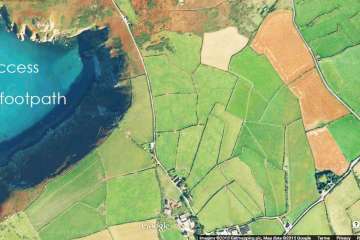 Strumblehead is a must - only 10 minute drive or 4 miles to walk. We saw a seal family feeding on the rocks. Amazing walks around the coast. 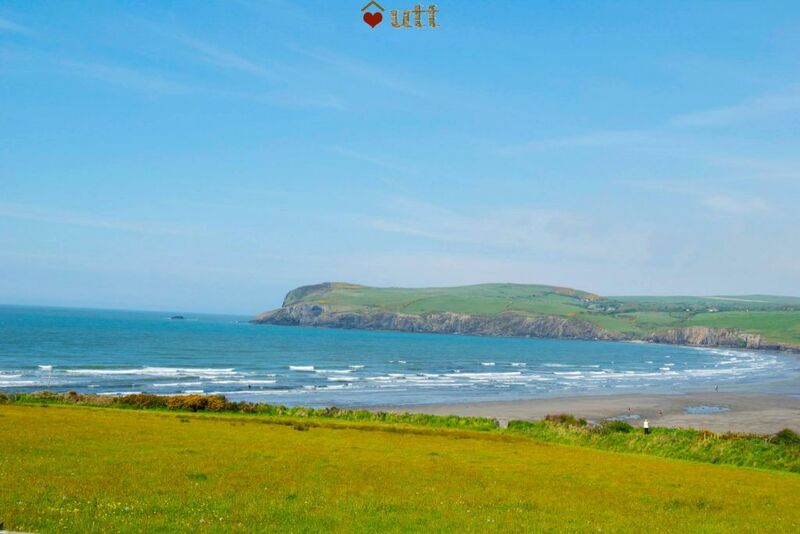 Whitesands / Newport sands all lovely beaches and all dog friendly. Porthgain is very quaint and 'the shed' fish and chips (although pricey) were lovely. The sloop restaurant here was also recommended but we ran out of time! The blue lagoon is also a must, as is a visit to st david's, especially the beautiful cathedral. A full 4 days! Fabulous to come back and enjoy the log fire. Simply lovely. Very warm and cosy and really well designed - we loved the kitchen/bedroom divider and tried to take it home but it wouldn't fit in our car. Great location for quiet days and nights lazing around or exploring the coastline on foot or by car. The 'Under Milk Wood' walk around Fishguard was great as was stopping at Ffwrn for lunch. We'd love to come back. 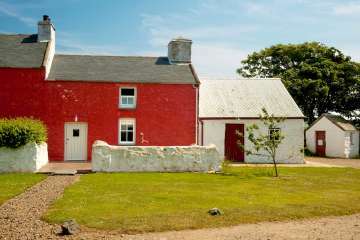 Fabulous cottage in a great location to explore Pembrokeshire. Highly recommended. This was our second visit to Beudy and we enjoyed this one as much as the last. The cottage is comfortable (we especially like that it has two big sofas in the living room) and clean. 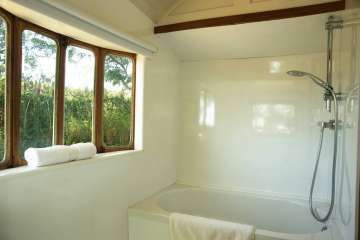 The wet room is great - especially after a long day's walking. The location of the cottage is good being close to the coastal path - so great if you like walking. There's a nice private garden area for sitting out in and a good sized parking area too. Although not within walking distance, there are good places to eat out nearby (The Shed at Porthgain being our favourite) and enough to do locally if the weather isn't good. 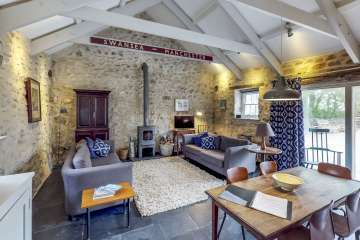 We had such a super holiday at Beudy Trehilyn - loved the converted cow shed, beautifully decorated, warm & finished to a very high standard. 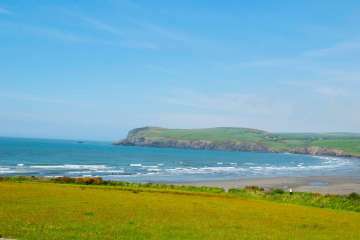 There is so much to see & do in the surrounding area, the Pembrokeshire coastline is stunning especially when the sun shines. 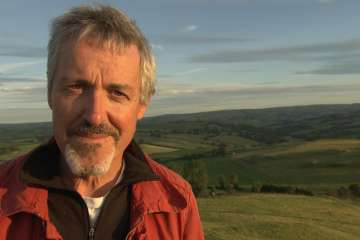 We WILL be back perhaps to try one of Griff's other properties. I will be recommending this property to friends. Beudy Trehilyn was everything we expected from it. Very nice exterior and interior, great surroundings, very quiet place. Great fireplace. We enjoyed our walks around the peremiter as well as the coastal path. Because it was just the two of us we didn't use the showmanswagon. Watching the "Pembrokeshire Farm" videos added to the feel of the place. We will definitely be back or try one of the other cottages. We had a lovely stay at Beudy Trehilyn. 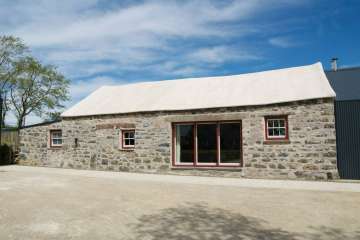 The cottage was very warm and cosy, and very well equipped with everything you might need. A real home from home. The countryside around was stunning, masses of snowdrops and daffodils etc. and there were plenty of walks to do with the dog too. The weather was perfect but even if it hadn't been, we would have enjoyed the cottage nonetheless. Excellent, and definitely a cottage to revisit. A fabulous Christmas retreat in this wonderfully restored gem. My Architect husband was impressed with the detailing (some of the best he has seen in all the places we have stayed in) so all credit to George, Griff and the team. 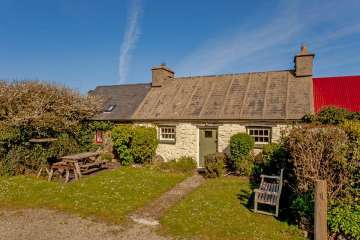 I'm sure we will be returning to enjoy some of the other Trehilyn properties in the future as this is such a beautiful part of Pembrokeshire to stay in. Really lovely conversion of agricultural building which retains its character, whilst being homely and stylish at the same time. We loved the farm & the surrounding walks were also stunning. We made full use of the show man's caravan & loved this additional bedroom, shame it isn't in the garden but not too far away for older children. We had a great time . Superb stay on the beautiful Pembrokeshire coast. 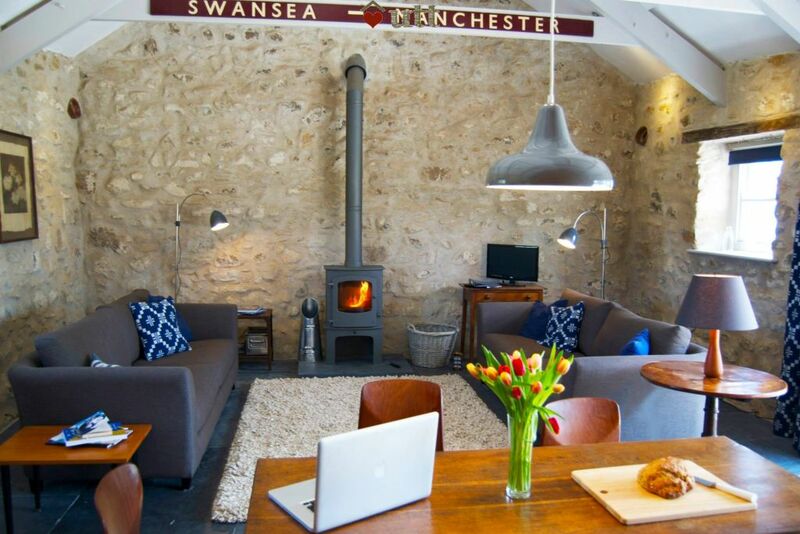 We had an amazing time at this holiday cottage, from the stylish decor, lovely wood burner and amazing views. There is a shop on site that has an honesty box for all your essentials including wood. No need to get in your car as you can walk straight from your door step including a lovely nature trail. 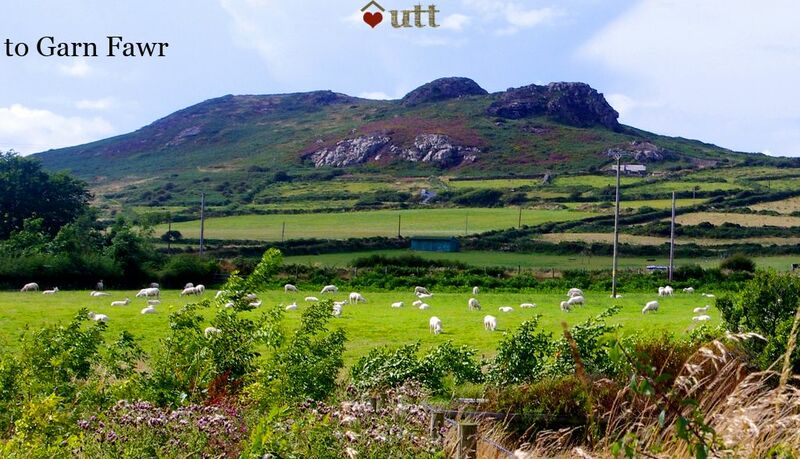 If there is a large family group there are other cottages close by to hire from UTT too. Would love to stay in all of them.